Alan and I visited El Morro on a warm, June day. After stopping in the visitor’s center, we followed the paved Inscription Trail (1/2-mile round-trip walk) to the base of the sandstone cliff. I could understand why travelers stopped at the tree-shaded pool, which is replenished by rainwater and snow melt. Continuing along the base of the rock, we began to see messages from long ago. First, petroglyphs and the hand prints of the Anasazi. Turning a corner, we came to a poem scratched into the stone by a Spanish explorer, followed by a letter chiseled in perfect penmanship by a Western adventurer. Over 2,000 inscriptions and petroglyphs mark the walls. However don’t think that you can leave your boomer message to eternity. 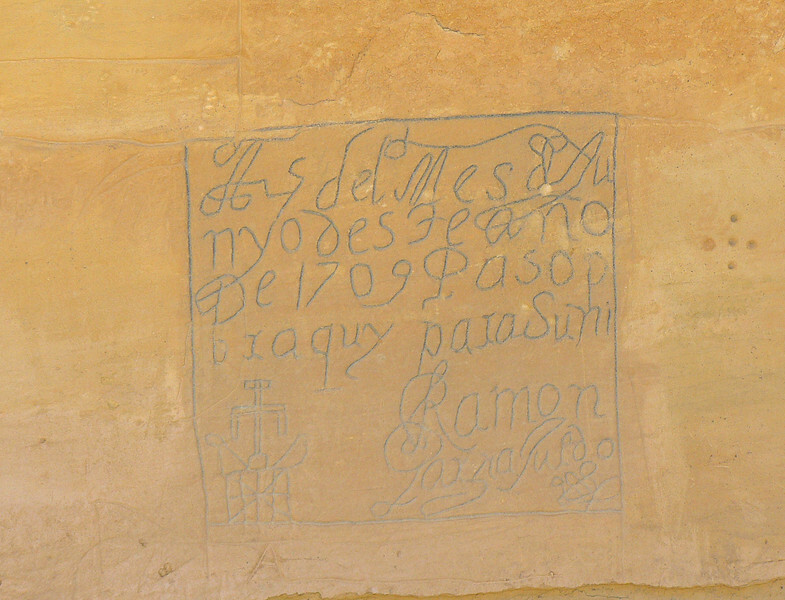 Since 1906, U.S. federal law has prohibited marking on the sandstone cliff of El Morro. The pavement ends as Mesa Rock Trail leads to the top of the mesa (2-mile round-trip hike from the visitor’s center). Climbing the stone staircase carved into the rocks will take you on a 200-ft climb to the remnants of an Anasazi pueblo. Due to the heat, we saved this hike for another day, opting for lunch at a shaded picnic area near the El Morro visitor’s center instead. 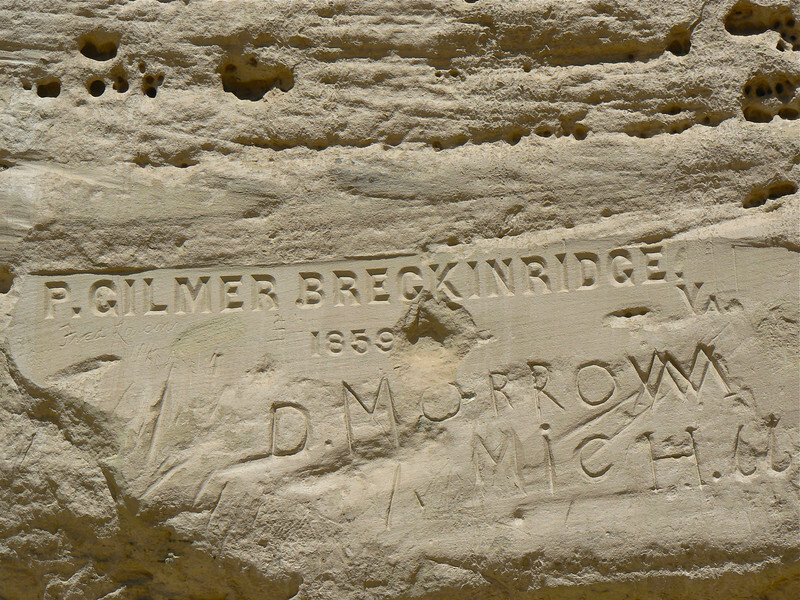 A walkway leads to graffiti from Western explorers. This is isolated country. 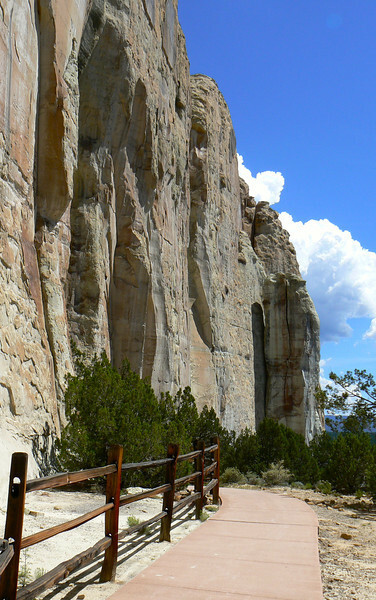 It’s about a 43-mile drive from Grants, the headquarters for our El Morro National Monument visit. More lodging is available in Gallup or Ramah. 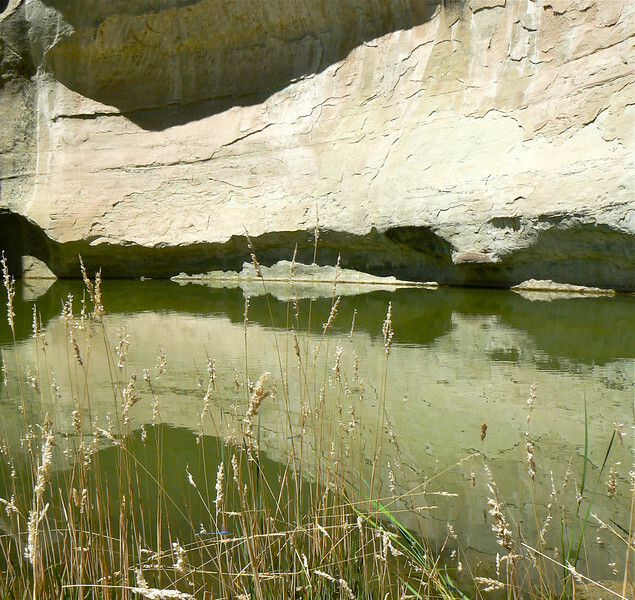 Another national monument, El Malpais, is located on SR 53, just up the road from El Morro. Lava flows, cinder cones and lava tubes dominate the rugged landscape. Alan had his heart set on driving the Chain of Craters Backcountry Byway. Unfortunately, rain had turned the high clearance road into a dangerous mud and caliche mix, so we saved this boomer adventure for another day. Want to follow in our footsteps. Our eguide, New Mexico Backroads Weekend Adventure will take you there. Have you visited El Morro or El Malpais? Join the conversation at the My Itchy Travel Feet page on Facebook or send us an email to ask a question or share your experience.